Beet chips are our newest foodie obsession–they have a rich, earthy flavour just like the beets in our Roasted Beet Salad, but they still have that appealing crunchy texture and saltiness of ordinary potato chips. The difference here is that homemade beet chips have great nutritional qualities, and fewer calories–think 280 calories per 28 chip serving vs 450 calories. 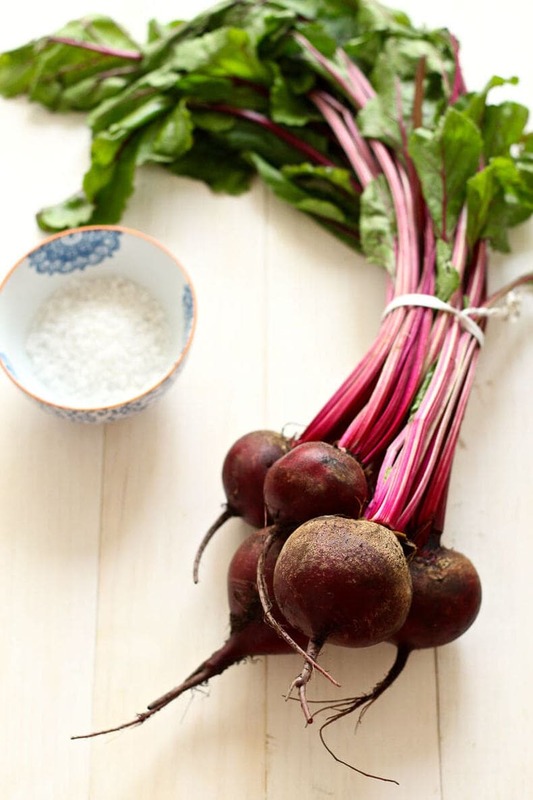 Heading into the fall season, beet chips are the perfect choice as the root vegetable is coming into season. All you need is a few beets, a mandolin and some olive oil and sea salt. There are so many dips you could make to accommodate these chips but these are delicious in their own right. We recently tried some at the Gladstone Hotel, and picked up a bag at Yamchops so naturally we were so obsessed we had to try making them ourselves. The French onion dip is also super quick and easy, and you can make it before the beet chips even have to come out of the oven. Just caramelize a yellow onion with a bit of butter and olive oil, and mix with sour cream and a tiny bit of Worcestershire sauce. The only challenge with this recipe is sticking around long enough to make sure the chips don't burn. Some inevitably will but it's okay. Pay close attention to the chips around the 20 minute mark. 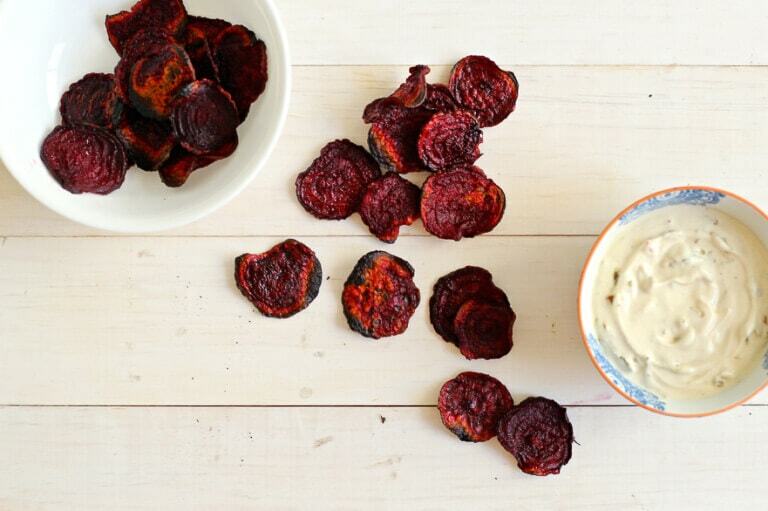 Will you be trying these beet chips? Can't you just imagine yourself with a big bowl of these on a Girls' night in with a glass of wine? 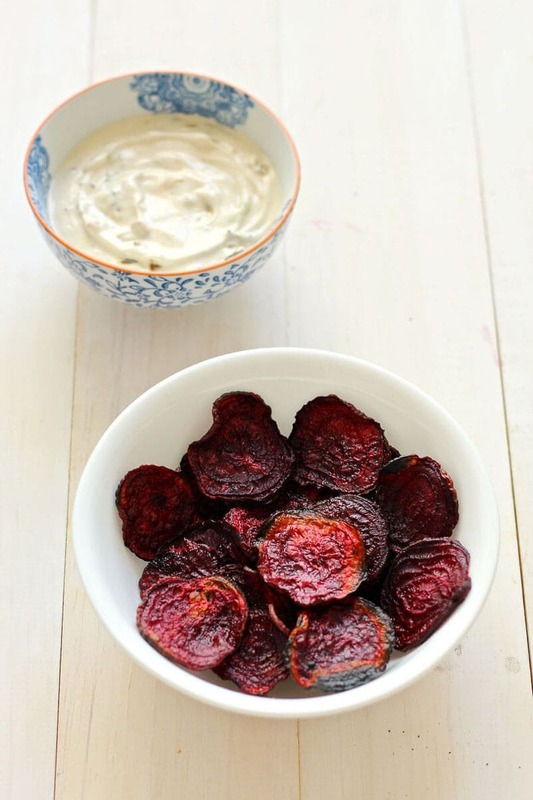 These beet chips are the perfect weekend snack, and surprisingly quick and easy to make. 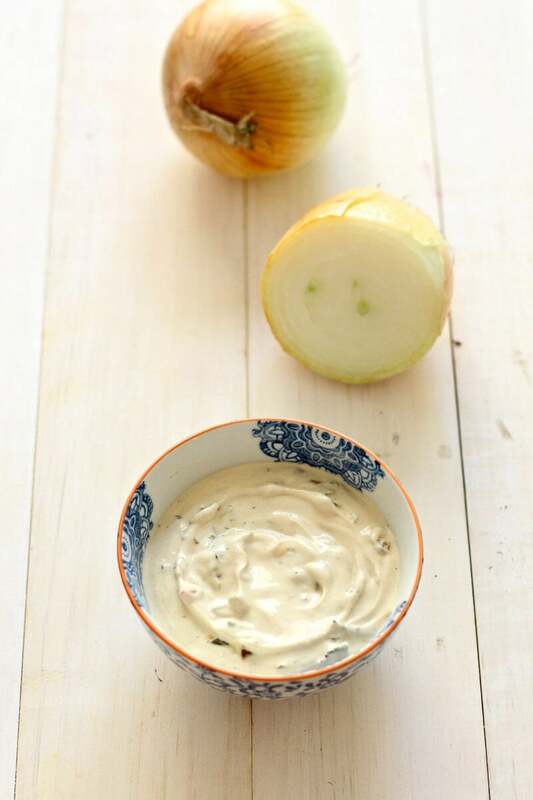 The French onion dip is made while the chips are baking in the oven. 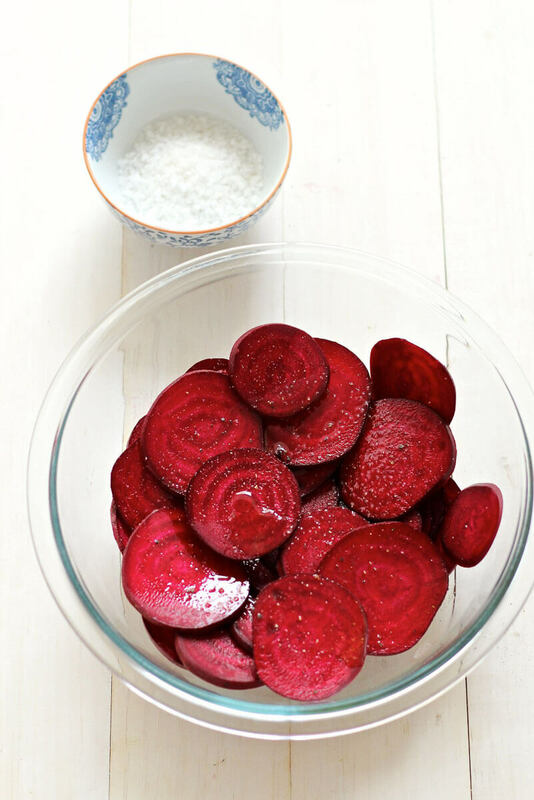 Slice beets as thinly as possible using a mandolin. Coat in olive oil, salt and pepper (if desired) in large bowl. Arrange on parchment paper covered baking sheet and cook in oven for about 20 min, watching so that they don't burn. Meanwhile, chop onions finely and cook in olive oil and butter over med-high heat until soft and mushy. Some of the onions may be a tiny bit burnt and crispy and that's okay. Add onions (including any remaining oil in pan) in with sour cream and remaining ingredients and mix together. 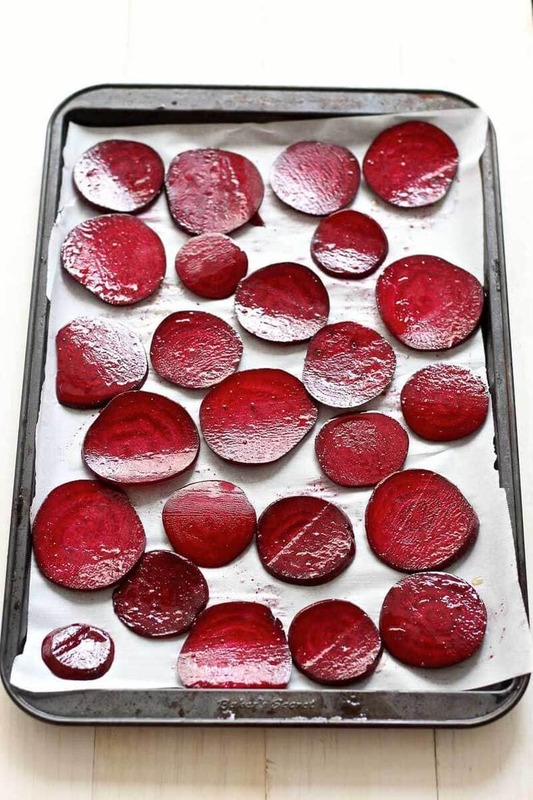 Take beets out of oven and place on paper towel-lined plates to remove any excess oil. Serve after about 5 minutes with dip! Do we precook the beets to rid them of skins? Hey Joan! I don’t precook them…the skins slid off easier when you’ve cut them super thinly with the mandolin! What is the total carbs count and fiber count for this. I’m on a low carb/no carb diet and have to track this info. Hey Shannon – unfortunately I don’t provide nutritional info on my older recipes. It’s just impossible for me to go back through my archives and update the hundreds of recipes I have. You can use a tracker like MyFitnessPal or My Plate to get this info. Hope that helps!